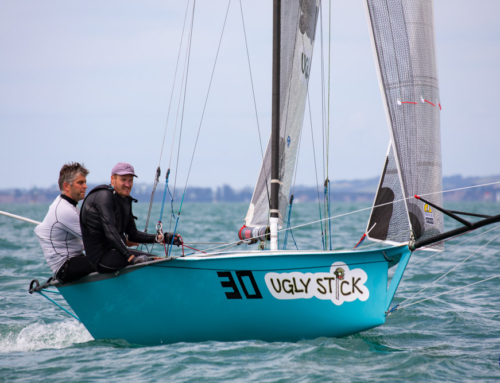 Home/12' Skiffs, All News/C-Tech wins again! It was a day that could have resulted in anything. The 12′ Skiff Interdominion Race Management team issued an amendment to the schedule bringing racing forward by one hour today (1pm start) and with a chance of three back to back races. The totally unpredictable weather conditions that tease Auckland was the cause of the change. So the sailors rocked up after mentally preparing to get smashed by three races. This left them, once again, with a decision to ponder. Which rig am I gonna sail with today?! It was a nice and steady 23 knot northerly. The aged 12′ skiffies threw back a few Voltarin’s and were ready for the day. C-Tech (Alex Vallings & Fraser Brown) returned to form. They stole two bullets again today… Is the story over? 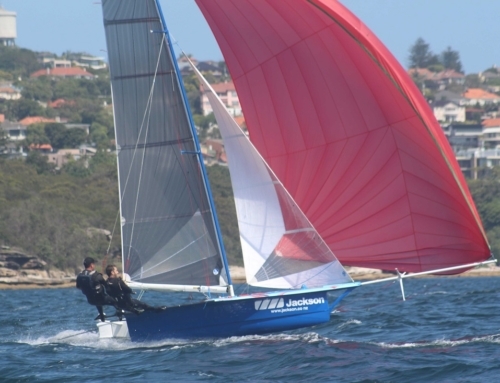 They are now 11 points ahead of second place, Sydney Sailmakers. The Top 5 for each race was the same. The overall top 5 is also the same. There was plenty of capsizes and airborne moments today with the big breeze, big swell and big Ferry waves. Racing continues tomorrow at the more respected hour of 2pm.